There were many inherent dangers along the Trace. Indians were a threat, and many families were captured or killed along the Trace. Wild animals were as dangerous as the Indians. Wolves were plentiful. Panthers were especially to be guarded against. They would crouch upon the overhanging tree limbs, and jump on passing travelers. Rivers and streams were major hazards. George Rogers Clark’s brother, Richard was traveling the Trace in 1794 and disappeared. His horse and possessions were found beside the bank of the White River at the Trace, but he was never found. An entire German family was said to have drowned at the Gutford crossing of Silver Creek, in present-day Clarksville. In 1807, the Larkins family was attacked by a band of Indians when travelling along the Trace. Mr. Larkins was killed, and his wife and her five children were taken into captivity. The incident sparked outcries for better protection along the route, and Territorial Governor William Henry Harrison organized the Rangers to protect travelers from Indian raids. The Rangers were modeled on the General Anthony Wayne’s troops at the Battle of Fallen Timbers. Their main job was to safeguard the Buffalo Trace between Louisville, Kentucky and the Indiana Territory’s capital of Vincennes, Indiana. The first Indiana Rangers who patrolled the road in 1807 did so on foot. 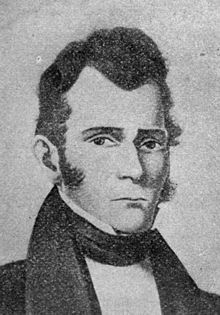 The Rangers had three divisions: Captain William Hargrove’s 1st Division patrolled from the Wabash River to French Lick. The 2nd Division, commanded by John Tipton (shown here), patrolled from French Lick to the Falls of the Ohio. One of their bases was at Cuzco, Indiana. The 3rd Division secured an area east along the Ohio River to Lawrenceburg, Indiana, on the Ohio border. All Rangers were required to supply their own horse, ammunition, tomahawk, a large and small knife, and a leather belt. Although the militia units lacked uniformity, the men were well trained. In keeping with their mission, the Indiana Rangers were involved in numerous incidents and soon clashes between Native Americans and white settlers effectively ended. Harrison disbanded the Indiana Rangers in 1809. Later, as tensions between settlers and Native Americans again increased, the Indiana Rangers were reactivated. Prior to the War of 1812, two Rangers companies were based out of Vincennes, Indiana. In 1812 when they were reorganized, the Rangers were mounted. Rangers under Captain William Hargrove enhanced the value of their service by capturing a man thought to be a British spy on the Trace, sending him to Clarksville to be held. In correspondence between John Gibson, Secretary of the Territorial Government, and Captain Hargrove of the Rangers, it was noted that the man, who professed to have been an Indiancaptive for two years, would not have such clean underwear beneath his buckskin suit. Gibson also deduced that his hair had been recently cut by a barber. Attacks by American Indians became frequent in Indiana Territory. Some, such as the Pigeon Roost Massacre, are still remembered. During the war, the Rangers were used to augment larger armies and Rangers fought with General Samuel Hopkins in the Second Tippecanoe Campaign (1812), where several were killed at the Battle of Wild Cat Creek. In 1813, the federal government authorized an additional four Ranger companies to secure the Indiana Territory. Each company had 100 men each, and as before, they armed and equipped themselves. The officers of the rangers were paid the same as those regular army officers of the same rank. Those with horses were paid a dollar a day, and those without horses were paid 75 cents a day. Trees often fell across the trail and could be difficult to manage, especially if the traveler were pulling a wagon or cart. The Rangers had the responsibility of clearing fallen trees and also to make sure the blazes that marked the trail were visible. Although much of the trace was readily visible as a deeply entrenched “cattle path” type trail through the forest, in places it was harder to follow. Early pioneers found their way through these sections by following blazes or nicks cut in trees along the trail by hatchets. During the winter, snow could obscure the blazes, and even the path itself. Mud in the spring bogged down wagons and heavy rain made even small creeks impassable. The Indiana Rangers inspired the creation of the more famous Texas Rangers in 1823 who had much the same role of protecting settlers in the new Texas territory. The 151st Infantry Regiment traces its heritage to the pre-statehood Indiana Rangers. The Regimental motto, “Wide Awake – Wide Awake!” was earned at the Battle of Tippecanoe. Delta Company (Ranger) was the only National Guard Infantry unit to serve intact during the Vietnam War, and were called the Indiana Rangers.